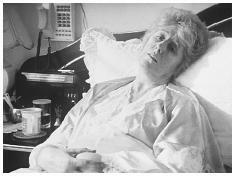 A terminally ill cancer patient who advocated for euthanasia in a 1999 Australian television commercial, said that she takes twenty pills a day in addition to three doses of morphine but is still in pain. Control of pain is a major concern at end-of-life treatment because terminally ill patients tend to have suicidal thoughts or make suicide attempts. achieving control. The partnership with the health care provider is even more important when the patient is facing the end of life. Pain, with no prospect of relief, leads to profound hopelessness in many patients. See H OSPICE O PTION . See E MERGENCY M EDICAL T ECHNICIANS . Thankyou for such a nice simple understandable (is this a word? )piece.I've just started trying to learn how to deal with my body pain after years of suffering.Keep up the good work and thanks again. Thank you for caring, and being an active advocate of those who are in terminal pain. I am glad to know more about what to expect when caring for a dying loved one,and when I am dying myself. I have always anticipated what that would be like. Because I've assumed unbearable pain can come with death, I have always been slow to use pain meds with my tendinitis and arthritis. I have been concerned that when pain like I have never known before would come in dying it would no longer be affective for me. Also after surgery, narcotic drugs have always made me more miserable with nausea. Thank you again for this article.